Filtrexx FilterSoxx: FilterSoxx are a tubular mesh container filled with locally manufactured, certified compost. FilterSoxx form a portable, easily filled, easily installed replacements for the traditional BMP's in virtually any type of setting or topography. FilterSoxx come in standard sizes 8", 12" and 18" diameter options and are custom made to any required length. Custom diameters, mesh sizes and length are available upon special order requests. Typical installation included inlet protection, storm drain protection, Check Dams, ditch check, sediment control on slopes and replacement for straw bales and silt fencing in standard applications. 12" diameter and large sizes are normally installed on site. By accumulating sediment and trapping silt the barrier created by the positioning of the FilterSoxx at the surface interface, FilterSoxx create a perfect erosion control barrier, providing a physical, chemical and biological filtration. Because they are heavier than competing products and flow through rate is much greater they do not require as much staking or trenching for successful installation, and the compost can be recycled simply by leaving it on site after sock removal or, in it's living sock form, it can become a permanent feature of the environment. 8" Dia. x 15' Available at our Midler Ave. location, at a price of $1.50 per foot. Other sizes available upon request, priced according to diameter and length. Ditch Chexx: Filtrexx Ditch Chexx replace hay or straw bales, rock check dams or other perpendicular devices used to slow down water traveling in a channel. They allow for easy placement and maintain a large footprint of ground contact, which is so critical when it comes to eliminating undercutting. The high degree of intimate contact associated with the product ensure performance, especially in high flow areas. 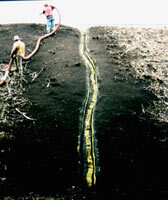 Ditch Chexx can be stacked and staked to achieve higher vertical limits for water flow control. 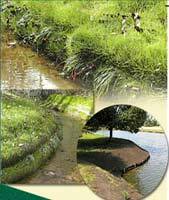 Filtrexx Edge Saver: One of the common problems associated with waterway is the erosion of the banks. Bit by bit, over time virtually all banks erode away and in the process they reduce the size of the landmass, create eyesores on otherwise attractive settings, and seriously increase the risk of danger. 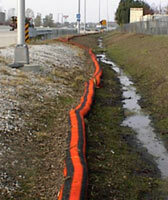 Filtrexx Edge Saver offers a practical, affordable, attractive solutions to all banks erosion problems. Channel Soxx: Channel Soxx are a tubular mesh container filled with locally manufactured, certified compost. Channel Soxx form a portable, easily filled, easily installed replacements for the traditional BMP's in virtually any type of setting or topography. Channel Soxxcan be seeded or unseeded. Channel Soxx come in standard sizes 8", 12" and 18" diameter options and are custom made to any required length. Channel Soxx replace the need for the labor intensive and time consuming Gabian Rock lined channels. Channel Soxx offer an inexpensive option for lining channels and repairing rills. Channel Soxx can be seeded with virtually any type of seed. 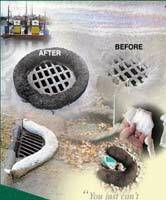 Filtrexx Filtersoxx: FilterSoxx are a tubular mesh container filled with locally manufactured, certified compost. FilterSoxx form a portable, easily filled, easily installed replacements for the traditional BMP's in virtually any type of setting or topography. Perfect for applications on asphalt or concrete. FilterSoxx come in standard sizes 8", 12" and 18" diameter options and are custom made to any required length. Custom diameters, mesh sizes and length are available upon special order requests. 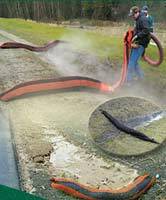 By accumulating sediment and trapping silt the barrier created by the positioning of the FilterSoxx at the surface interface, FilterSoxx create a perfect erosion control barrier, providing a physical, chemical and biological filtration which other BMP's are unable to do. Replaces straw bales, sand bags, etc.